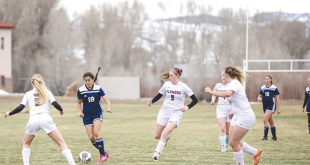 Last spring was the inaugural season for the Crested Butte Titans high school girls soccer program. For years the idea of a high school girls team was talked about and last year it all came to be a reality, and a strong one at that. The program was required to play the first year as a “test” and therefore was left to find any and all games it could against more established programs. This season, the Titans are officially in a league with a full schedule facing several of the same teams the boys play—i.e., Telluride, Ridgway, Bayfield, Pagosa Springs and so on. The schedule includes a handful of non-league games as well. Furthermore, they are eligible for a shot at the 2A state tournament if all goes well. The team started pre-season on March 1 and Kidd has 30 players out this season building off what was started last season. “We are able to have a varsity and a JV, which creates competition and we can provide a more competitive level and a more developmental level, which bodes well for the future,” explains Kidd. She also has the benefit of her assistant coach, Alexis Charles, returning for a second year with the squad. “She brings a wealth of soccer knowledge,” says Kidd. As one can imagine though, pre-season has been a struggle with the team limited to workouts in the gym while the snow slowly melts. 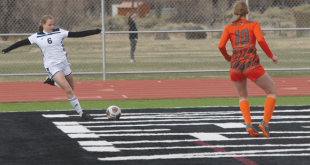 The girls got their first chance to get out on the grass when they headed to Montrose on Wednesday, March 8 to play the Montrose JV and C teams. The Titans saw some success against Montrose as they beat the C team 3-0 but lost to the JV team 2-0. The Titans got their next test on Monday, March 13 when they endured a five-hour bus ride, complete with a rockslide delay on McClure Pass, to play Aspen. Aspen is a 3A program and had the benefit of a turf field, which they plow to open it up for the spring programs, including girls’ soccer. “While we’ve been in the gym, they’ve been playing outside the whole pre-season,” says Kidd. The Titans struggled against the stronger Aspen team with a majority of play in the first half in front of the Titans’ net. Goaltender Rachael Potoker proved to be the difference, with numerous saves to keep the game tied 0-0 in the first half. Aspen scored early in the second half and then tacked on a second goal on a direct kick later in the game for the 2-0 Aspen win. “I was pretty impressed that we could even compete with them,” says Kidd. If the current weather pattern remains, the Titans may be able to get some time on a field in Gunnison, but space is limited with so many programs throughout the valley sharing the coveted grass fields. The Titans return to the road on Tuesday, March 21 when they head to Ridgway for a league game and will remain on the road until their first home game, in Gunnison, on April 3. Once the Titans get a few games under their belt and some practices outside, Kidd is confident they will build off of their success last year and she looks forward to a strong season.